A pan of these Homemade Chocolate Chip Brownies will satisfy any chocolate craving you may encounter. This easy brownie recipe will give any box mix a run for the money. 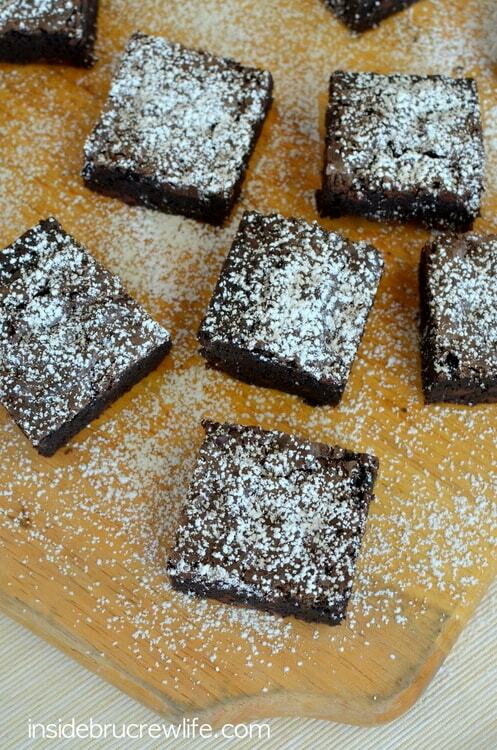 Use this easy base recipe to make these delicious Coffee Cream Brownies. I have a slight problem when I bake. 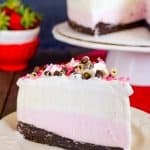 Have you noticed that I don’t do plain when it comes to brownie desserts? I like to embellish my brownies with loads of extra candy and chocolate. 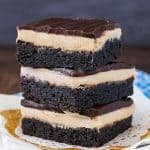 I mean have you seen this Peanut Butter Brownie Dessert? Layers of brownie, pudding, candy, and peanuts. It makes my sweet tooth so happy! Every so often my family asks for “plain” brownies or just chocolate chip cookies. That is so hard for me to do! I do want to make them things that they ask for (no matter how boring I think it may be), so I have to hold back from unloading my baking cabinet into those plain treats. Let me tell you, that’s hard! My mind goes a million miles a minute when it comes to thinking up new and exciting treats to bake up. Things like these Caramel Marshmallow M&M Brownies just make me so happy! Now most of you also know that I am more of a baking mix kind of a baker. I enjoy taking pre-packaged mixes and using baking magic to transform them into a semi-homemade dessert with flair. It’s kind of my specialty. I also love boxed brownie mixes. There is something about them that I have not tasted in a homemade brownie before. Until now that is. Recently, I have started buying old church cookbooks from Goodwill. They are full of great ideas when you get in a baking slump. Not that that happens to me much. My list of ideas is so long, that I may never bake through it. But I was flipping through one of the books the other night, and I came across a recipe for homemade brownies. Our youngest has been asking for plain brownies for a few days, so I decided to throw in the towel and try making brownies from scratch. I went ahead and followed the directions exactly because I wanted to see if I liked it, or if the recipe needed tweaked. They tasted great, but they were not that rich dark chocolate color that I was looking for. For the second batch I made the brownie recipe with dark cocoa powder in place of the baking chocolate squares, and there it was! That chewy brownie texture and dark chocolate color that I had in my mind. Line a pan with foil or parchment. 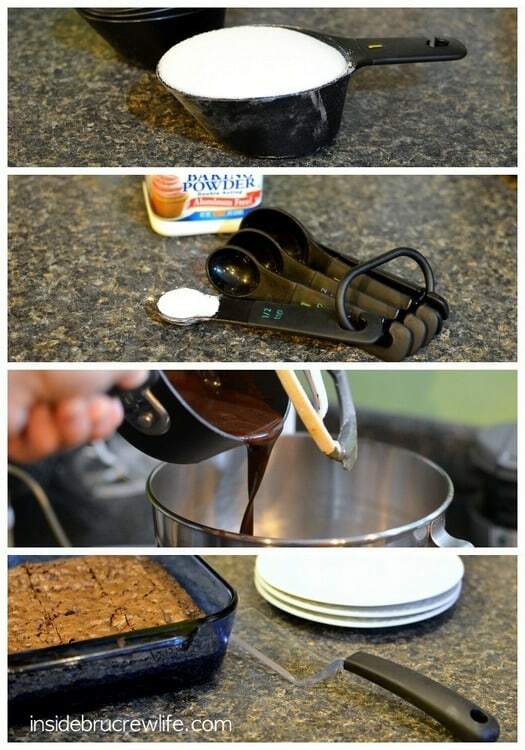 This makes it easier to lift the brownies out of the pan later. Melt the butter and whisk in the cocoa powder. Let it cool slightly. Beat the eggs, white sugar, and vanilla until light and frothy. What makes the top of brownies flaky? Beating the eggs and white sugar longer results in a flaky crackly brownie top when it comes out of the oven. This increases the top layer which is actually just a meringue. Pour the cooled chocolate into the egg mixture and beat it again. Stir together the dry ingredients and slowly mix them into the batter. Stir in any mix-ins that you like now. Nuts, chocolate chips, toffee bits, or candy are all delicious mix-ins for brownies. Your brownies are done when a toothpick inserted in the center comes out with some sticky crumbs on it. Let the brownies cool for at least 30 minutes before cutting into them. How do you cut brownies cleanly? Let them cool. Warm brownies fall apart easily. Use a warm knife and clean it in between cuts. Or chill them in the refrigerator before cutting them. Now I tried my hardest to just make the brownies plain. I figured what kid doesn’t like chocolate chips. And powdered sugar is surely plain enough. Oh no, I heard all about it from my kids. They still want the plain chewy brownies. I guess chocolate chips and powdered sugar are not plain enough. They did say they were the best brownies ever, but they requested another pan without any mix-ins. The layers in this Frozen Brownie Sundae need to happen very, very soon. 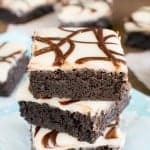 A white chocolate topping and chocolate drizzles make these Zebra Brownies a fun after school snack. 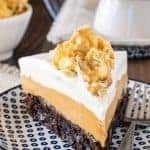 This decadent Irish Whiskey Brownie Pie is a must make for all chocolate lovers. 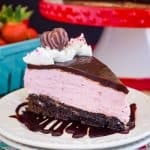 A Hot Fudge Brownie Cheesecake is the perfect dessert to end any meal with. Preheat oven to 350 degrees. Line an 8x8 baking pan with foil and then spray with nonstick baking spray. Whisk together the melted butter and cocoa powder and set aside. Beat the eggs until light in color. Add the sugar and vanilla and beat again. Add the chocolate butter mixture into the eggs and beat until mixed in. Sift together the flour, salt, and baking powder and slowly add to the egg mixture. Do not over beat. Pour the batter into the prepared pan. Bake for 25-30 minutes. Let cool completely before cutting into 9 squares. My family asks for plain things too … what is this? My baking list is SOOOO long now, too (thanks to PInterest:) And I love our boxed brownie mix and “updating it” to be blogworthy. 🙂 Its a problem. But seriously, these look perfect. Fudgy, full of chocolate chips, sprinkled with powdered sugar – ready to take on any chocolate craving! Haha, I know! Crazy people 😉 Thank you so much Mary! I love finding old cookbooks as well… So many ideas out there! These brownies look amazing! These look incredibly fudgey!!! I feel like I am always adding “flare” to my recipes and my boyfriend is like, this is good but I would prefer it without the this and that. Umph. Whatever. Hahah. 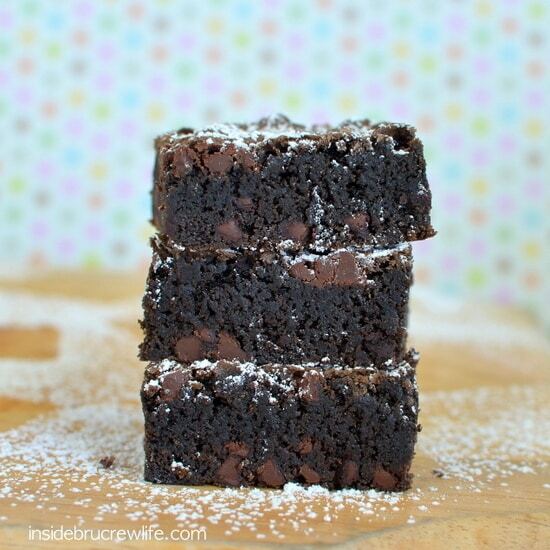 These “plain” brownies are gorgeous, moist and chocolatey. There’s really nothing plain about them! I can tell just by looking at them that they’re perfect without any candy embellishments! HA, I am just like you and your family sound just like mine. They are always asking for chocolate chip cookies and simple brownies and cakes. I am into over the top and they are more simple. LOL! Love these brownies! I always add chocolate chips to mine too! YUM YUM YUM! You cannot beat a good, old fashioned brownie. These look like the best! Oh my goodness Jocelyn – these look perfect. I so love brownies- I could eat the whole tray if no one was around to stop me. I sometimes prefer homemade over box, it is a toss up! These look wonderful! In the past, I have made brownies from scratch … my family likes the boxed mix! I will try your recipe … it sounds better that the ones I’ve used in the past 🙂 My family likes plain too. There’s just something about that boxed mix! 🙂 Thanks Brenda! Kids! What do they know?! I love everything you come up with! Haha, right?! 😉 thank you so much!! Oh how I love a good brownie. Doctored or not, I love em! Nothing beats a good homemade brownie!! I love brownies. These look amazing. The only thing that could make them better is a big scoop of vanilla ice cream. It must be something all of us crazy bakers experience!! 😉 Thanks Emily!! I love both box mix brownies and homemade. The only brownie I don’t like is the type that’s way too cakey and not chocolatey enough. I do have a problem with your recipe: an 8×8″ pan of brownies is just never enough!! 🙂 Thanks for sharing, Jocelyn. I like to look through those old cookbooks too. My mother has quite a few at her house. I’m not that into cakey brownies either, bring on the gooeyness! 😉 Thanks Jelli! 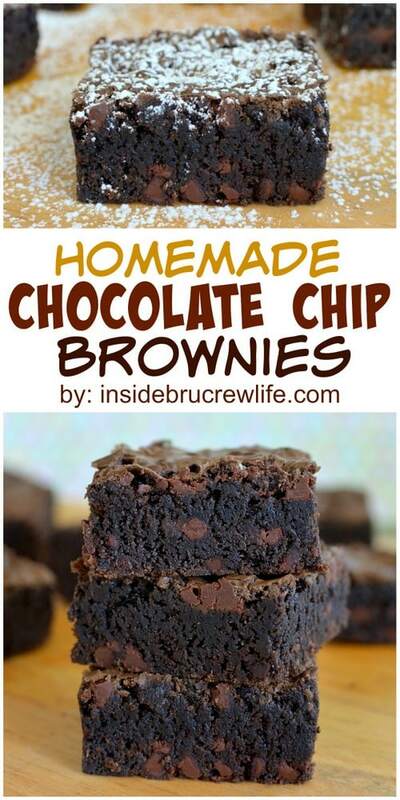 I love a good homemade brownie – these look perfect, Jocelyn! 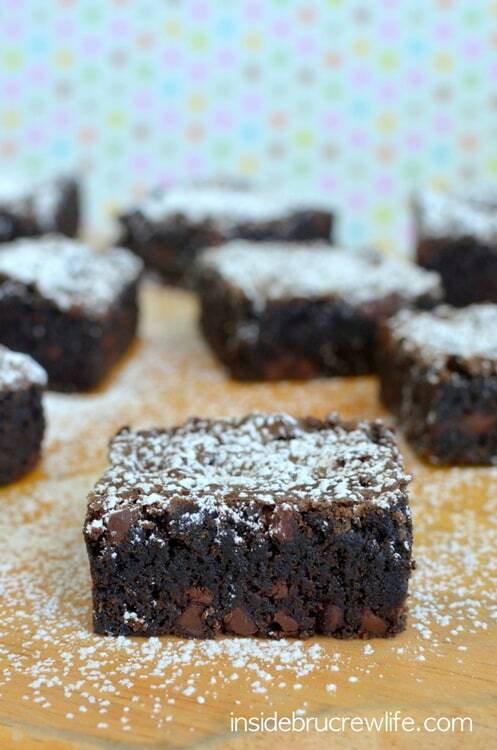 These brownies are absolute perfection! I desperately need a brownie fix right now at 11:11PM! I love the idea of putting chocolate chips into the brownies, I shall bare that in mind next time I bake a batch. Delicious! I think you showed great restraint in the plain department. 😉 I’m interested to try this recipe. My favorite brownies are made with melted chocolate, but cocoa powder is usually cheaper, so I’m always on the hunt for a good cocoa brownie. I did too! Lol! Thanks Renee!! MMMM! I think Brownies are by far one of my favorite desserts! These look so good! One of mine too! Thanks Amy! I am confused, the directions say to mix in hot chocolate but it isn’t listed in the ingredients? Am I reading this wrong? Can you elaborate for me? Thanks- these look delicious and I am anxious to make them! I just made these I skipped the chocolate chips and added crushed candy canes to fit the holiday season. I am so excited I have never actually made brownies from scratch before. I make everything else from scratch so I am very excited!! 5 minutes left on the timer! I just made these tonight! They made my kitchen smell amazing. I have made these twice now and with fantastic results. I did make a substitution though. I used half brown sugar and half white. Amazing brownies. I will NOT use a boxed mix again. Thank you!!!! The recipe says add 1/4 cup hot chocolate to eggs. Is this 1/4 cup of the mini chocolate chips melted?? Sorry that wasn’t clear…you are going to add some of the melted chocolate mixture into the eggs to temper them. I changed the directions to say that better. I hope you enjoy the brownies! I’m just dying over these, I can’t wait to get my chocolate on again this week! I bet you’re feeling the same way, aren’t you glad you went the plain (but absolutely decadent) route this time? 😀 I know I am! Been putting chocolate chips in my brownie recipe for years and we love the that way! I put 1 cup of regular size chips in mine though! My recipe calls for 3 eggs. My favorite words – easy and chocolate. 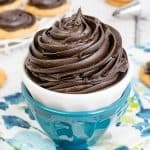 Can’t wait to make these and I love it that the ingredients are pantry friendly. Going to make these hoping doubling the recipe works. I am very excited. I work with a group called piecemakers we make quilts for cancer patient to bring them God’s word and comfort while they are dealing with chemo and all the other trials of fighting the beast. I have doubled the recipe before using a 9×13 baking pan. I hope your group enjoys the brownies!!! These look amazing! Tying my apron on now! Thanks for the post! Hi! 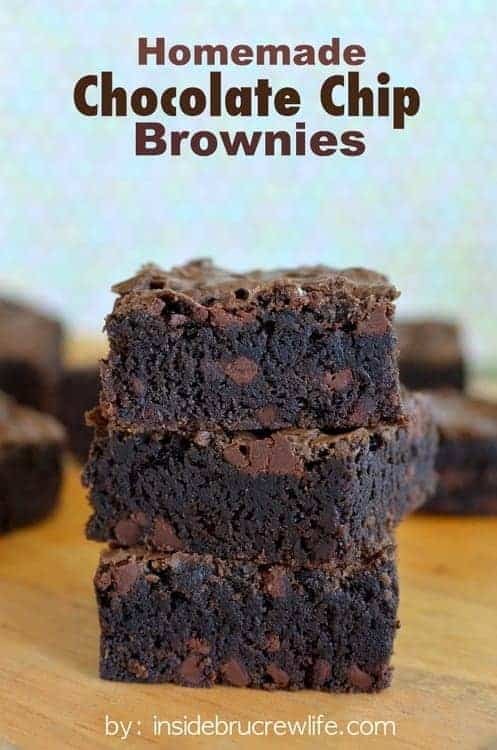 I just wanted to thank you for sharing this amazing recipe, this was my first time making brownies from scratch and these are by far the best i’ve ever tasted… ever!!! I’ve made MANY many brownie recipes of all varieties, and this is one of the best cocoa-based brownie recipes I’ve ever tried! Delicious! Thanks for posting!